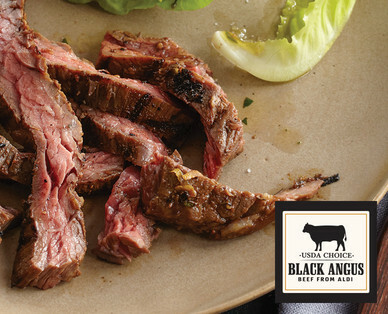 The Choice Skirt Steak is a lean cut of quality beef that is prized for its natural rich flavor. Pair this steak with your favorite marinade and cook quickly over high heat to create savory fajitas and stir-fry dishes. Recommended cooking method: skillet, grill or broil. When you shop at ALDI, you’ll find that our fresh steaks and roasts are all packed in vacuum-sealed, leakproof packaging. This guarantees that your meat will stay fresher, longer. The deep purple color means there’s no air in the package and is an indicator of freshness. Once the package is opened, the meat will turn the bright red you’ve come to expect in high-quality beef.